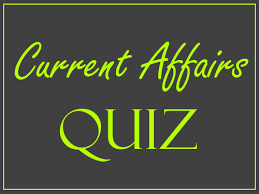 We provide current affairs quiz for IAS Exam on a daily basis. Such current affairs IAS questions are very important for the upcoming IAS Prelims Exam to be held June 2017. Practicing these current affairs quizzes, an aspirant can check their progress of their preparation for IAS Exam. The significance of current affairs in IAS Prelims and IAS Mains Exam has become larger. The IAS aspirants are required a comprehensive study to cover the topics of daily current affairs. Here, for the convenience of IAS aspirants, we have provided current affairs IAS questions created from the events recently happened. 1. Recently, one of the rare birds in the Himalayas, Bohemian Waxwing has been sighted by a bird-watcher in which of the following places in India? One of the rare birds in the Himalayas, Bohemian Waxwing has been sighted by a bird-watcher in the tribal district of Lahaul-Spiti for the first time. Bohemian waxwing (Bombycilla Garrulus) is of the size of a starling and belongs to Eurasia and North America. In winters, the birds from Eurasia are known to migrate up to China and Japan. But their migration to the mountains of India is not really well documented. I. PMGDISHA is expected to be one of the largest digital literacy programmes in the world. II. Under the scheme, 25 lakh candidates will be trained in the FY 2016-17; 275 lakh in the FY 2017-18; and 300 lakh in the FY 2018-19. III. To ensure equitable geographical reach, each of the 250,000 Gram Panchayats would be expected to register an average of 200-300 candidates under the PMGDISHA. The Union Cabinet has approved the 'Pradhan Mantri Gramin Digital Saksharta Abhiyan' (PMGDISHA) to make 6 crore rural households digitally literate. The outlay for this project is Rs.2, 351.38 crore to usher in digital literacy in rural India by March,.2019. This is in line with the announcement made by Finance Minister in the Union Budget 2016-17. PMGDISHA is expected to be one of the largest digital literacy programmes in the world. Under the scheme, 25 lakh candidates will be trained in the FY 2016-17; 275 lakh in the FY 2017-18; and 300 lakh in the FY 2018-19. To ensure equitable geographical reach, each of the 250,000 Gram Panchayats would be expected to register an average of 200-300 candidates. The implementation of the Scheme would be carried out under the overall supervision of Ministry of Electronics and IT in active collaboration with States/UTs through their designated State Implementing Agencies, District e-Governance Society (DeGS), etc. 3. Recently, India has signed a MoU with Senegal in which of the following field? The Union Cabinet has given its approval for signing a Memorandum of Understanding (MoU) between India and Senegal in the field of Health and Medicine. I. BIMSTEC is a regional organization comprising of only seven Member States surrounding the Bay of Bengal. II. BIMSTEC organization came into being through the Bangkok Declaration. III. It constitutes seven Member States including Bangladesh, Bhutan, India, Nepal, Sri Lanka, Myanmar and Indonesia. Initially, the economic bloc was formed with four Member States with the acronym 'BIST-EC' (Bangladesh, India, Sri Lanka and Thailand Economic Cooperation). This sub-regional organization came into being on 6 June 1997 through the Bangkok Declaration. It constitutes seven Member States: five deriving from South Asia, including Bangladesh, Bhutan, India, Nepal, Sri Lanka, and two from Southeast Asia, including Myanmar and Thailand. 4. Which statement best describes the objective of the term “BioAsia”, often seen in the news? a. BioAsia seeks to enhance, enrich and encourage newer innovations, path-breaking discoveries and effective solutions in the biotechnology industry. b. BioAsia is an Environmental conservation campaign all around the Asia. c. BioAsia is an awareness programme of the World Health Organisation. BioAsia seeks to enhance, enrich and encourage newer innovations, path-breaking discoveries and effective solutions in the biotechnology industry by offering a vibrant global platform for convergence of the key stakeholders - Biotech & Biopharma Companies, research institutions, investors, service providers, policy makers, regulators and analysts. Biotechnology being an emerging industry, game-changing strategies and relevant application of the knowledge-intelligence resource pool, drive the process of growth. With an objective of optimizing the immense business potential of biotech, BioAsia enables an effective environment for fostering collaborations, joint ventures that has increasingly become an integral part of industry growth agenda.